I was out with a friend a week or two ago when an E36 M3 blew by us on the highway. As it passed, I said something like "Wow, look at that". I really wasn't saying that to my friend (I'll say stuff like that when I'm alone, too), but she thought I was and replied "What's so special about that? It looks like your car." I explained the differences between my car and the M. Just before she nodded off from boredom, she said "Still, it doesn't look any different. If I owned a car like that, I'd want the world to know it's special". For the most part - and I admit that there are exceptions - the Japanese and American car manufacturers deck out their performance cars with scoops, wings, spoilers, graphics, etc. They scream "I'M SPECIAL", even if sometimes they're not. That's not the way the Germans do things. It's performance that matters. Germans do a few subtle changes to the body, but let the performance do the real talking. Personally, I like that. If an M3 Coupe doesn't look "special" enough to some people, then the almost invisible 4 door E34 M5 will not impress them either. It impresses me, though. A lot. All M5s were built by hand. According to one website, "Assembly was done either by a single M employee, or a team of M employees, and generally took about two weeks. 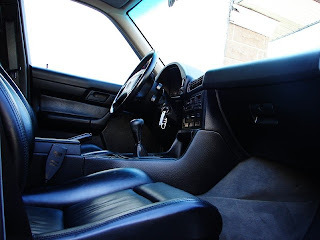 It is rumoured that the test drivers of the E34 M5 could determine who or what team made each specific M5, due to characteristic quirks of the hand built nature of the E34 M5. 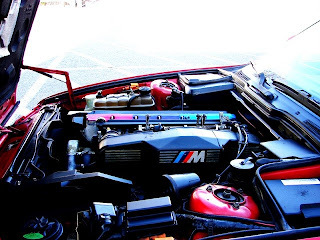 The engines were also built by hand by BMW M technicians". How cool must it be to see an M5 on the road and know that you might have built it? Not just installed a bumper or transmission or whatever, but built the whole car... Damn. That 311HP hand-built 6 cylinder engine gave the M5 a 0-60 time of 6.4 seconds and an electronically limited top speed of 155 MPH. A car that fast needs a suspension that can match the power. The M5 suspension, compared to the standard E34 suspension, has a 20mm reduction in ride height, 25 percent firmer spring rates, firmer shock valving and thicker antiroll bars. As for the body, the only real differences (besides badging) between the standard E34 and the M are the lower body molding and a slightly different front airdam and rear "air diffuser". Subtle, yet very cool. 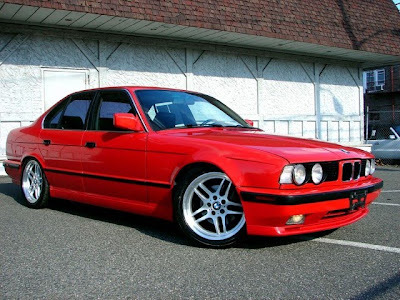 This appears to be as nice of an E34 M5 as you'll ever find. It has just 55,000 miles on it. The body and interior appear to be flawless. It has a Dinan chip and suspension. In bright red, this car is less subtle than most M5s. (Only 200 or so M5s were painted red.) Still, it doesn't scream "I'M SPECIAL". My friend would most likely not be impressed by this car. But, it impresses those of us who like driving and that's really all that counts. Located in Paterson, NJ, click here to see the eBay listing. Late 80's autocrossing in Pittsburgh. An older - weathier guy had one of these. It was amazing to see a car this large move so well. And the sounds as it hit the rev limiter...aahh. Gone are the days when subtle meant having the number "6.9" tacked onto the lip of your trunk. Gone are the days when subtle meant having the number "6.9" on the trunk lip of your Benz. I bought this exact car and had it transported from patterson (seriously). Pretty nice ride... I get more comments on it than any other car I've ever owned (I've had a few "less than subtle" cars too). Paint wasn't as flawless as the pictures indicated... but I love it.